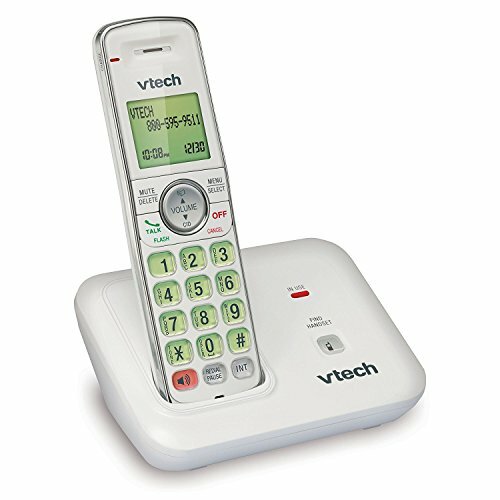 The VTech CS6419-17 DECT 6.0 Expandable Cordless Phone with Caller ID and Handset Speakerphone is built to give you all the features a busy household needs. With the touch of a button, the handset speakerphone makes hands-free conversations easy. Caller ID entries display on a large, backlit LCD screen so you can see who's on the line even in the dark. Missed calls? This phone stores up to 50 calls so you can review who called while you were out. With DECT 6.0 transmission, the VTech CS6419-17 DECT 6.0 Expandable Cordless Phone with Caller ID and Handset Speakerphone gives you private, interference-free sound from any room in your home. Because the system supports a total of five handsets, you can add up to four additional CS6409-17 accessory handsets to the system with just one phone jack.